OTB TV is headed to New York City for episode 3. NYC is known as the city that never sleeps and in this episode we’re giving fans an exclusive invitation to party with their favorite players at some of the hottest events ahead of the US Open. Where else can you glow in the dark with Garbine Muguruza, get in the zone with Angelique Kerber and dine and dance with the pros? OTB correspondent Vince Spadea continues the party by bringing his own unique style to the colorful carpet of the Citi Taste of Tennis. Citi Taste of Tennis creates a delicious combination of tennis stars and world renowned chefs like Iron Chef’s Masaharu Morimoto. Spadea was there as the players arrived for a night of food and fun and wasn’t afraid to dig right in. 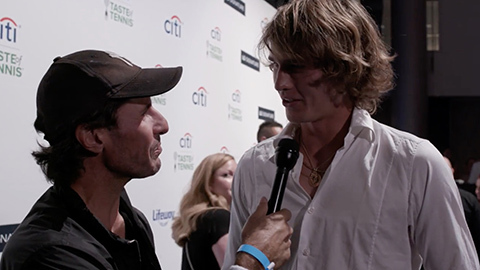 Alexander Zverev was ready for what the top chefs had to offer as he told us he wasn’t a picky eater. We can’t talk about fun without fun’s unofficial ambassador, Murphy Jensen. We’re back with Mayleen Ramey as she hits the court with the Fondation LACOSTE and the City Parks Foundation for a heartwarming afternoon of tennis and dancing. Murphy Jensen and LACOSTE pros like Jeremy Chardy and Christina Mchale spend an afternoon in Central Park to share expert advice to aspiring young kids in the community. The free tennis clinic aims to provide a playful atmosphere and encourage a life long love for the sport. Outside the Ball is taking you beyond the game with this and so much more in episode 3. Tune in every Thursday at 9AM EST on beIN SPORTS USA for your all access pass to the pros! Next Article Petra Kvitova Gives Her Favorite Meme PETRA APPROVAL!